Jazz Dock is a waterside club on the riverbank directly opposite Detsky Ostrov Playground (Children’s Island). Every Saturday from November to May it offers children’s theatre shows followed by craft or performance activities. This is a great last-minute option to consider on the weekend as tickets are purchased just prior to each performance. I love Jazz Dock’s location right by the river, it’s very modern and in Summer the windows roll back giving the impression of being on a boat. As it is located near to one of the lochs you have a passing parade of riverboats to entertain you before and after the show. 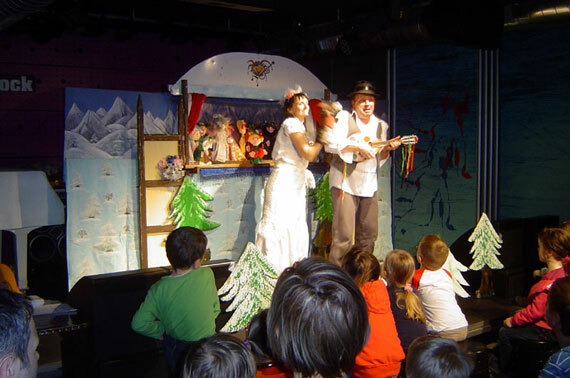 I need to mention early on that the children’s theatre shows are performed in Czech but if the show is well targeted towards it’s young audience I feel that kids with little or no Czech may find it just as entertaining. The ideal age range I’d say would be 3 to 8 years. So for me the big advantage is being able to purchase tickets just before showtime so you don’t have to be organised and pre-pay like in other venues. Tickets are 50czk per child and 70czk per adult and under 2’s are free, so it’s a reasonably priced afternoon out for all. A kids menu is displayed on every table and priced well, there are the usual favorites including ice cream sundaes. For the adults there is a well stocked bar so if you’re up for a beer or even just a coffee or mineral water it’s all there. Be warned there are about 15 or 20 steps down to the the entrance so if you come with a pram be prepared to carry it down - there is no ramp. So Every Saturday a theatre company or performer create a show for children which is followed by a craft or group activity. Lucie and I have caught a few performances at the kids theatre show and most of them have been great, I will warn you to proceed with caution or avoid altogether shows performed by Divadlo Anicka a letadylko (Anicka and her Little Plane Theatre Company), the performance we viewed was truly awful and inappropriate for children (for starters she produced a razor on stage and waved it around in a maniacal fashion). But generally you’ll find that the performers are professional and members of experienced theatre troupes very much in tune with their young audience. They usually present a mix of puppetry and conventional theatre along with catchy songs, many of which the children seemed to know. Check Jazz Dock’s website in April for the April show announcements. There is usually a link to the performer’s website where you can further investigate their work and even view their performances on-line before deciding if you’d like to attend. 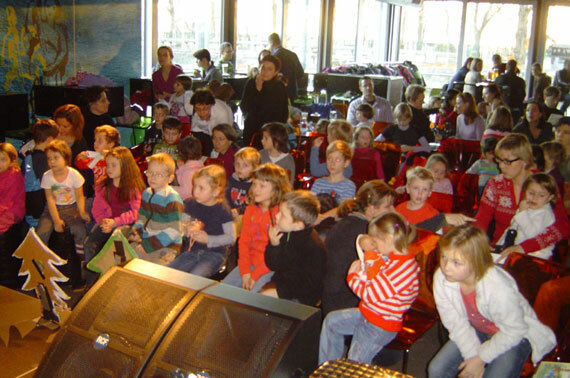 Jazz Dock has monthly programs in English on the tables to take home which list all performances including the kids theatre shows. And if you love any type of jazz, blues and folk music then consider the evening shows for a night out. Jazz Dock is one of the leading venues in Prague and features local talent as well as a diverse range of international artists. It’s also a fantastic spot on a warm evening. DIRECTIONS: Easiest is by Tram: Take 6, 9, 12, 20 to tram stop Švandovo Divadlo or 4, 7, 10, 14 or 16 to tram stop Zborovská. By Metro: Take the yellow B line to Andel, you will need to walk 3 blocks to the river. By Car: Prague 5 has no paid parking so you can park anywhere, it was very easy to find a car spot right opposite Jazz Dock. By Ferry: Prague’s cute little ferry service re-opens on 1 April. Catch the ferry from below the National Theatre to Detsky Ostrov for a lovely afternoon treat.